Aug 15, 2017 • After more than 15 years of research and writing, the Landsat Legacy Project Team* is about to publish, in collaboration with the American Society for Photogrammetry and Remote Sensing (ASPRS), a seminal work on the nearly half-century of monitoring Earth’s lands with Landsat. Born of technologies that evolved from the Second World War, Landsat not only pioneered global land monitoring, in the process it also drove innovation in digital imaging technologies and encouraged development of global imagery archives. Access to this imagery led to early breakthroughs in natural resources assessments, particularly for agriculture, forestry, and geology. 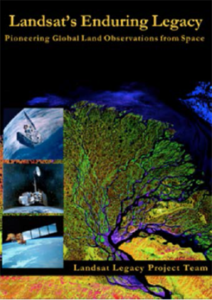 The technical Landsat remote sensing revolution detailed in the Landsat Legacy Book was not simple or straightforward. Early conflicts between civilian and defense satellite remote sensing users gave way to disagreements over whether the Landsat system should be a public service or a private enterprise. The failed attempts to privatize Landsat nearly led to its demise. Only the combined engagement of civilian and defense organizations ultimately saved this pioneer satellite-based land-monitoring program. With the emergence of twenty-first century Earth system science research, the full value of the Landsat concept and its continuous 45-year global archive has been recognized and embraced. Discussion of Landsat’s future continues, but its heritage will not be forgotten. The pioneering satellite system’s vital history is captured in this notable volume on Landsat’s Enduring Legacy. The book will be published prior to the Pecora 20 meeting (in Sioux Falls, SD, November 14-16, 2017) and will be unveiled at a special evening session at that conference. Another celebration to mark the publication of the book will take place at the library at NASA’s Goddard Space Flight Center (GSFC) in December. Additional details will be provided in the next issue of The Earth Observer.